Xian Lim is the new matinee idol. And it seems like he has it all. But when asked what’s his secret to all his success he smiled and said, “My mom”. Xian Lim credits his mother Mary Ann as the force behind the positive changes in his life. In an interview on "Showbiz Inside Report" aired last May, the actor thanked his mom, who raised Xian by herself after her separation from her husband. Xian even told his mom this sweet message, “hindi uusad yung buhay ko kapag wala ka”. 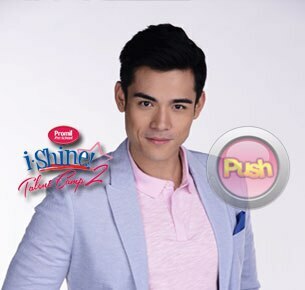 That’s why Xian Lim, as one of the hosts of Promil Pre-School i-Shine Talent Camp 2, is proud of the latest developments on the show. Like him , these 12 i-Shiners namely: Nica Mores, Mhae Mejos, Krystal Brimner, Nathan Bautista, Kurt Garcia, Shawnly Atuel, JM Andres, Thea Cervas , Gianna Somilon, Isaiah Pascual, Jesse Ongteo, Yesha Camile are supported by their parents and are ready to impress everyone with their talents in singing, dancing and acting! The 12 i-Shiners went through more comprehensive workshops with top caliber mentors. Teacher Pinky taught the students on the proper breathing and body exercises, as these are equally important to improve the i-Shiners' techniques in singing. Teacher Georcelle, on the other hand, emphasized the importance of following instructions from your teacher in order to master the skill in dancing. Lastly, Teacher Piolo stressed the value of imagination and being present in the moment when you act in order to imbibe the character and scene required from the i-Shiners. You can help your favorite i-Shiner become the grand i-Shiner! Text ISHINE <Name of iShiner> and send to 2366. 30% of their final score will be coming from your text votes! Promil Pre-School I-Shine Talent Camp 2 airs on Saturdays at 10am before Be Careful with my Heart Rewind. Hosts are Dimples Romana, Xian Lim and Matteo Guidicelli.